Your book is out. The critics are raving. And now you are going to a huge outdoor festival to sell and sign every book you have in your stash. Times are great. But when you stride in, confident and assured, you realize you left something at home. Something that makes the rest of your day miserable. We’ve all been there, done that. I thought I would offer up my checklist for what every writer should have to enjoy a gorgeous day greeting the public and how to survive when the day is miserable. It may sound foolish, but I’ve seen it happen and almost did it once myself. 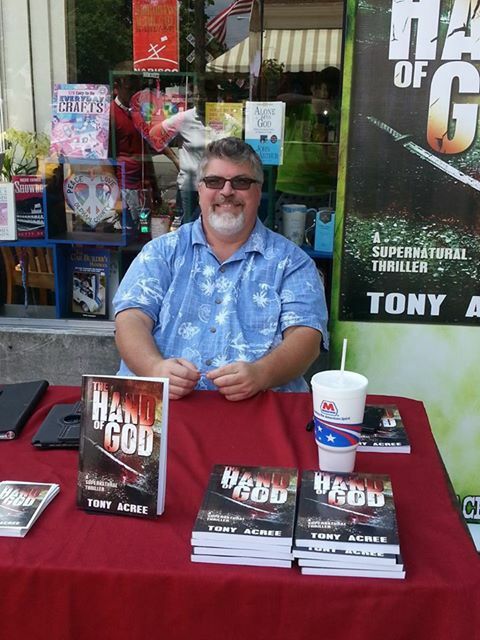 I was at a book signing setting up my booth, when a guy a couple of booths down the row, started swearing. He’d made the trip, but forgot his books. Sounds silly, no? But as I was pulling out of my driveway to head to the Grove City Wine and Art Festival, I realized my books were not packed for the trip. My wife and I switched cars at the last minute and while I’d moved the rest of the gear, the books were still sitting in the backseat of the other car. Nothing like paying for a table, driving four hours and finding out you were going to drink a whole lot more wine because you didn’t have your books. Don’t laugh. It could be you. You check the weather report and there’s only a ten percent chance of rain. Then you show up and an hour after the event starts, Mother Nature lowers the boom and it pours, but you don’t have a canopy. Or just the opposite happens and it’s 100 degrees and you have no shade and at the end of the day you look like something out of a lobster shop. Ouch. If you plan to do a lot of outdoor events, a canopy is a must. I have one that is 10 feet by 10 feet. It keeps the sun off of you (most of the day) and will keep the occasional rain showers away as well. I would also pick up several canopy weights to hold down the four legs. I’ve seen strong winds take out a whole row of tents at an author’s fair. Don’t let it be yours. Here is a listing of canopies at Home Depot. Some events provide tables for you. But those are mainly indoor events. Outside? You are on your own. Sitting on the ground and selling books while swatting ants is never fun. I use a six foot folding table. It fits in the back of my car, along with my canopy, and goes up quickly. And comes down just as quickly for fast getaways. Once again, from Home Depot. Not only do they not provide tables at most outdoor events, they don’t provide chairs. Ever tried standing for 12 hours? Not fun. And bring as comfortable a chair as possible. Only use an old folding chair if you’re trying to repent from some transgression and you need punishment. Mine? I use the Cabela Quad Chair. So you are all set up. Canopy, table, chair and books. You’ve paid to have electricity in your booth so you can keep your iPad charged to take credit card payments, and you look around for the plug. But unfortunately, the plug in is 20 feet away and you forgot your extension cord. Five hours later your iPad dies (because it was at 35 percent when you left home) and you lose out on sales because you can’t take credit cards. Even when they supply electric for your booth, it’s almost never right by your table. If you forget your extension cord, you’ve blown your money. I forgot mine for Oldham County Day, but the nice people next to me had an extra cable and I was good. Don’t you hate it when you have your new poster placed on the easel at the front of your booth and then you feel it: a hint of a breeze. It catches your poster on the corner, it tips and then, whoosh!. It’s gone. You pull out scotch tape and put some on the back of the poster, then press it down. A few minutes later, whoosh! It’s gone again. If you’d brought duct tape, then you could have plastered that puppy down in such a manner that Hurricane Screw-Your-Day wouldn’t be able to screw your day. Versatile and all the people around you will love you when the wind kicks up and they stop by your booth to borrow your roll. Finally, you need to make sure you have your Sharpies. People like to buy books from you at events because you will sign them. And borrowing a Crayon from a kid in the booth next door so you can scrawl your signature is not overly professional. I take four to each event. Because I sell so many books and the ink runs out? Sometimes. But mainly because I almost always leave a cap off of one of them and they dry out. It happens. There are other things you can use for your events: Banners, posters, cards, snacks, bags for book sales, bag for garbage, water to drink. A two-wheel dolly can save your back if you have to carry books a long distance. But they won’t ruin your day if you leave them at home. Forget any of the previous items and you may wish you were back inside writing instead of outside selling.